Apart from the course syllabus and different topics that will be covered in JQuery 2.0 certification, a comprehensive exam will also be conducted in order to assess your learnings and skills as well as hone your knowledge about the specific field. 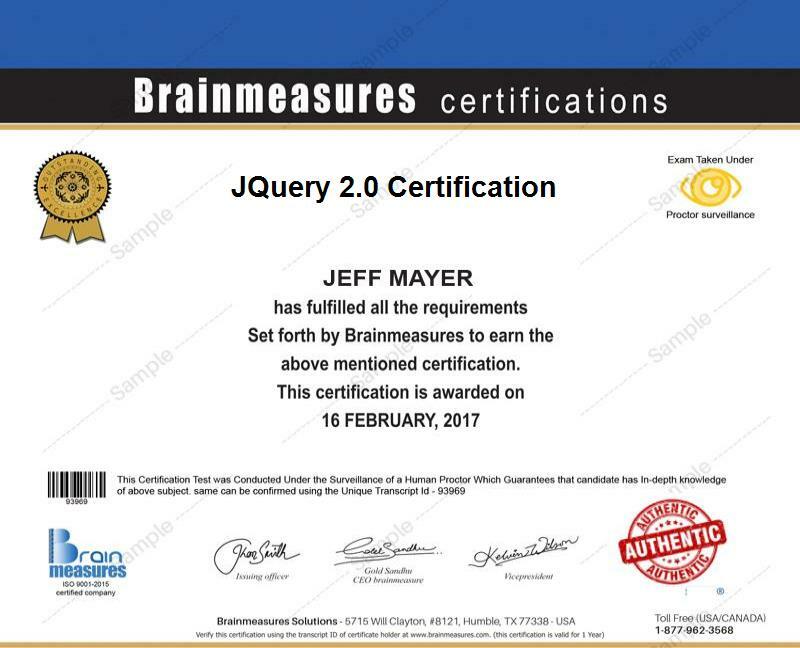 After a successful attempt, you will be on right way to get your JQuery 2.o skill certificate from Brainmeasures. This will be definitely an added skill not only to improve your Resume but also make it easier to get the job that requires you to apply your scripting and web development skills by using JQuery 2.0. Taking into consideration the extreme popularity of JQuery 2.0 at present especially for smart phones and tablets compatibility along with other platforms, it is no longer surprising to see a huge increase in the number of people who wish to take part in the JQuery 2.0 certification program which is now available at Brainmeasures. This certification course is primarily designed for web developers, webmasters and programmers however JQuery 2.0 covers the large user base that also includes IT experts, software engineers and websites analysts.